The Internet is a marvelous place, I had never heard of pre-war Opels existing outside of a few museums and then I get 2 e-mails in as many months. Derek Ryan from John Kelly (Waterford) Limited in Ireland needed advice on where to find Brakes and cylinders for a 1937 Opel Kadett and Devinda S. Senanayake who, I would guess from his e-mail, is based in Sri Lanka, was in urgent need of two dashboard meters- ie speedometer/odometer and fuel/temp meter for his 1938 Opel Kadett. I have never stocked parts for Opels from this period and the Opel brand was only introduced to the UK in the 1960s, the best I could do was to suggest contacting the Vintage Vauxhall Opel Bedford Association who should be able to provide some links to parts suppliers in Germany. It also occured to me that it's a long shot, but I think that Kadett was cloned in Russia post WWII as a Moskvitch. The first Opel car to carry the Kadett name was presented to the public in December 1936 by Opel's Commercial-Technical director, Heinrich Nordhoff, who would in later decades become known for his leadership role in building up the Volkswagen company. The new Kadett followed the innovative Opel Olympia in adopting a chassis-less monocoque construction, suggesting that like the Vauxhall 10 introduced in 1937 by Opel's English sister-company, the Opel Kadett was designed for high volume low cost production. Competitive pricing led to commercial success, and Kadetts continued to be produced during the early months of the war: by the time production was interrupted in 1940 following intensification of hostilities, 107,608 of these Opel Kadetts had come off the assembly line at Opel's Rüsselsheim plant, which had been the first major car plant in Germany to apply the assembly-line production techniques pioneered by Henry Ford. After the war, Opel production facilities from Brandenburg an der Havel (trucks) were crated up and transported to the Soviet Union as part of a larger reparations package agreed upon by the victorious powers. 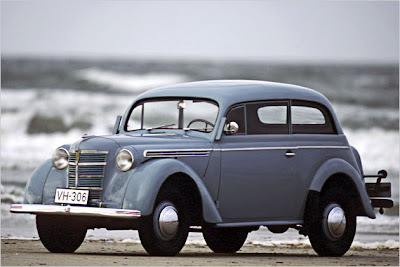 From 1948 the prewar Kadett was manufactured as the Moskvitch 400/420: it continued to be produced on the edge of Moscow as a Moskvitch until 1956.